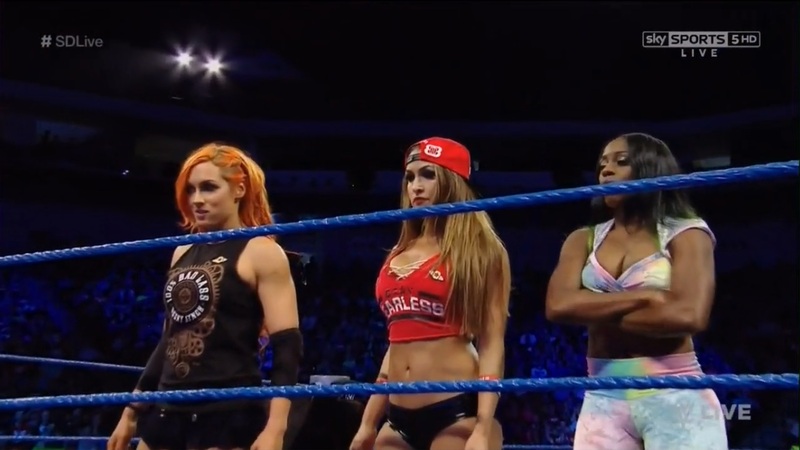 In the last Smackdown Live before Backlash, Alexa Bliss, Carmella & Natalya teamed up to take on Becky Lynch, Naomi & Nikki Bella, got a chance to main event the episode, but would the blue brand be able to head into it's first PPV in almost ten years with momentum? The main event, featuring the six women who will compete to become the brand's Women's Champion on Sunday, was a mixed bag as Alexa Bliss, Carmella & Natalya picked up a victory over Becky Lynch, Naomi & Nikki Bella. 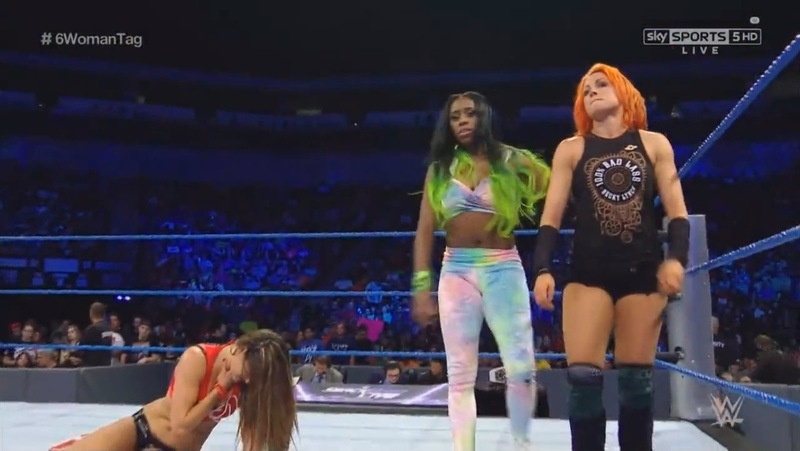 For the most part, the action was well performed and well put together, with the heel team dominating Naomi and then Lynch, working well as trio. Natalya performed a couple of double team moves with either Bliss or Carmella with David Otunga explaining the situation well, talking about how Natalya was attempting to form bonds ahead of the six pack challenge. Teaming Natalya with Carmella and Bliss will definitely be a help to the lesser experienced women, as they continue to grow and learn as in-ring talent. Lynch works well in the face in peril role, getting a couple of flash pin attempts kept things interesting and the crowd involved, however, I feel saving her for the full on hot tag would have gotten a stronger reaction, than Lynch tagging in Bella. The main problem for this match was the one that will cast the most doubt over how good their six way on Sunday will be, as the breakdown segment was more than a little bit sloppy. There seemed to be an issue with timing, as some of the women were unable to keep up with the others, leading to either rushed spots or a lot of fumbling. There were some nice ideas though, like Bella taking Bliss' Insult to Injury [Standing Moonsault Double Knee Drop] in the melee, before Carmella would lock in Code of Silence [Modified Figure-Four Headscissor] for the submission victory, playing on Bella's previously injured neck, whilst also continuing to build the feud between Bella and Carmella. However, seeing as Sunday will call for a lot of similar action, it wasn't the greatest advert for the PPV clash. Hopefully the booking will be able to cover up the short comings of some of the performers, otherwise the bout might struggle to keep up any real pace. In this week's opening match Intercontinental Champion The Miz picked up a victory over his SummerSlam opponent Apollo Crews in a decent contest, that featured Miz's BackLash challenger, Dolph Ziggler, on commentary. Miz and Crews might not have the best wrestling chemistry as was seen in an awkward hope spot for Crews involving sunset flips, but what both men can offer was on clear display here, as The One Man Nation got to display his agility and Miz's own brand of crafty cowardice was there as well. These two elements made for an interesting match, that whilst it was nothing to get too excited about, was entertaining from start to finish. That finish would see Miz get into an argument with Ziggler at ringside, before Crews would enter the conversation and then found himself sent into The Show-Off and then the ringpost before finally succumbing to The Skull Crush Finale [Full Nelson Facebuster]. Maryse having to retrieve the Intercontinental title belt from Ziggler, whilst Miz stood on the outside put the exclamation point in place and left their feud poised nicely for a 11th September showdown. The conclusion of the show would be the go-home segment for AJ Styles v World Champion Dean Ambrose on Sunday as the pair dual on the microphone, after quickly sending interviewer Charly Carusso packing. I felt like both men did a better job selling this feud across these eight minutes of television, than has been managed across the previous two weeks of television. There were some parts, like Ambrose handing Styles his old bowling trophy, which initially seemed goofy, but would pay off come the end of the segment, that made this back and forth an especially rewarding watch. Both men brought some fire to their performances, as they threw clever barbs at each other, with The Phenomenal One keeping the fire burning with John Cena, with Ambrose reminding Styles that he wasn't Cena and they wouldn't be having a wrestling match on Sunday night. It was intense and entertaining, with Ambrose's final rant getting the crowd pretty excited about the upcoming tangle between the pair. We'd have to be reminded of the terrible angle from last week where Ambrose rocked Styles on the top rope, when Styles gained a modicum of revenge with a kick to the balls, but the smashing of the bowling trophy (which Ambrose had offered as a consolation of sorts for the upcoming "loss") over his knee was a nice touch that bought the show to a satisfying conclusion. It was a big night for the Women, as they not only got to main event the show, but also featured in the opening segment that saw General Manager Daniel Bryan initially introduce Becky Lynch, before Natalya, Alexa Bliss, Carmella, Naomi and Nikki Bella would all get involved. This was the last opportunity to hear from the Women's division, I'm not sure that it delivered much at all. The initial promo from Lynch had fire and told a nice story of her trying to finally win a championship and live up to her potential, but Bryan awkwardly shilling Total Bellas in the middle of it hurt the flow and once Natalya had fully interrupted I felt like the segment struggled to find it's feet. The villainous trio of Natalya, Bliss and Carmella would end up bickering like school girls, before eventually looking to turn on Lynch and Naomi and Bella were out for the save. With the six woman tag only delivering in part, it was a shame that this segment didn't manage to sell the upcoming supercard all that well either. The run of Heath Slater and Rhyno continued as they picked up a victory over The Hype Bros [Mojo Rawley and Zack Ryder] to advance to the final of the Tag Team Championship tournament. This was a fun match with a very captive crowd. The Slater and Rhyno act has caught fire over the last few weeks and this meant that the crowd were hooked, ferociously awaiting the hot tag to Rhyno and essentially turning Rawley & Ryder heel. The pop when The Man-Beast finally got into the ring was ridiculous! The relationship between Slater & Rhyno continued to build with The War Machine once again having to rescue Slater from a precarious position, this time Ryder's Broski Boot, before getting the pinfall for the team with a Gore. The Hype Bros performed their roles well, in a match that had more going for it than just the Slater & Rhyno bromance, with Rawley seeming to fit better into the spoiler role than his partner. Will Slater & Rhyno be able to ride their momentum all the way to the Tag Titles on 11th September? Maybe, just, maybe. Also in the Semi-Finals of the Tag Team Championship Tournament, American Alpha [Chad Gable & Jason Jordan] went over The Usos [Jey Uso & Jimmy Uso] in what was more of an angle than it was a match. The bout lasted less than thirty seconds after American Alpha turned the tide on a pre-match attack, sent Uso #2 to the outside and pinned Uso #1 with Grand Amplitude. It was a surprisingly short bout, but the real talking came directly after the contest as The Usos turned heel for the first time since 2011, attacking Gable & Jordan post-match and specifically assaulting Gable's leg. They pulled out a series of nasty looking holds, that were delivered completely differently to how the duo have been portrayed over the last five years or so. It was a brilliant angle that has been building for sometime between the four and will make any potential re-match between the pair miles bigger than it was at this point in their careers. In a weird turn of events, Kane chokeslammed Fandango and then did a bit of Fandangoing, all of this happened after Fandango claimed that a middle-aged woman's hips lied. Smackdown Live #890 was an average show, on a brand that has struggled to find it's identity since the Draft. The Women's Division got a chance to shine with a main event and an opening segment, gifting the females a huge portion of the air time and unfortunately I don't feel like anyone stood up and made the time their own, whilst the division as a collective didn't manage to do that either. The match was okay, with a sloppy closing stretch, the interview segment had promise but again fell apart towards the end. As an advert to a match involving everyone in the division it wasn't great. The strongest part of the show was probably Dean Ambrose and AJ Styles who used what was a fairly limited time slot to push a PPV World title bout and made the most of it, building an interesting story for their bout and adding extra layers within it. Outside of that, Miz continued to build on his character, even if his feud with Dolph Ziggler doesn't excite me and the Tag Team tournament continued to be entertaining, without any standout efforts, as The Usos and American Alpha bout was used an angle for a future feud. This was an alright episode of Smackdown Live, which isn't really what you want to be saying heading into the brands first PPV in almost ten years!